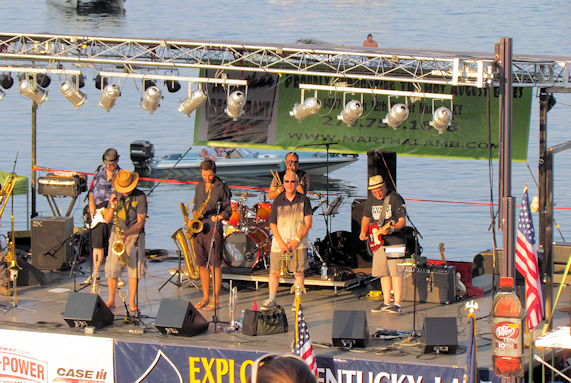 You are here: Home / Kentucky Cities / Aurora / 2014 Hot August Blues at Kenlake State Resort Park is in its 25th Year! 2014 Hot August Blues at Kenlake State Resort Park is in its 25th Year! Although this event has expired, there is always something to see and do in Kentucky. Visit our Kentucky Events page for up to the minute happenings and be sure to check out our Things to Do in Kentucky page. Keep an eye on Genuine Kentucky for information about the 2015 Hot August Blues Festival! There are certain festivals, fairs, and events in Kentucky that are so wildly popular people talk about them year round. The annual Hot August Blues Festival at Kenlake State Park is just such an event – and has been for 25 years. For a festival to last that long, you KNOW they’re doing something not just right but really right! Grab your calendar and circle August 22 and 23 because that’s when The Hot August Blues Festival at Kenlake State Resort Park will do things really right again. The festival is held at the park’s amphitheater on the shore of beautiful Kentucky Lake. The show opens Friday, Aug. 22, at 6 p.m. with Noah’s Back Alley Blues. The program on Saturday, Aug. 23, starts at 2 p.m. with Nightfish. Advance tickets are $15 for Friday and $20 for Saturday. Two-day advance tickets are $30 a person. Children 12 and under are free. Tickets at the gate are $20 for Friday, $25 for Saturday and $40 for both days. Advance tickets may be purchased online or at these locations: Roof Brothers Wine & Spirits in Paducah; Kaylee’s Farmhouse Restaurant in Aurora, the UPS Store in Murray and at Kenlake State Resort Park (cash only). More ticket and schedule information is available at www.hotaugustbluesfestival.com. The festival is held rain or shine, and guests may bring chairs and coolers (no glass). A shuttle service from the park lodge and campground will also be available. As a warm-up for the festival, Kenlake will host its Neighborhood Night Free Concert Aug. 21 from 5-9:30 p.m. Two bands are scheduled to play, the Andy Gibson Trio from 5-7 p.m.; and Adam and the H-Bombs from 7-9:30 p.m. Guests are invited to bring lawn chairs for an evening of blues music on the front lawn. The concert is free, but donations will be accepted for the Marshall County Exceptional Center. The park restaurant will be open 5-9 p.m., and special lodging rates for Thursday night starting at $54.95 for a lodge room are available. Kenlake State Resort Park is located minutes away from the Land between the Lakes, a 170,000-acre nature lover’s paradise and environmental education area. Kenlake offers lodging, cottages, campground and restaurant. For more information about the park, call 1-800-325-0143. Below are links you’ll find useful while you’re in the Kentucky Lake and Land Between the Lakes area. Belew’s Dairy Bar Drive In (Aurora) – famous in the area for hamburgers, fries, ice cream, chili dogs, and more! *** The last three recommendations involve short drives to Kenlake State Park, but the accommodations are excellent and the short drives are gorgeous, so it’s all good! While in the area, be sure you check out The Hitching Post in Aurora for Kentucky Food, memorabilia, delicious fudge (!!! ), gifts, antiques, and A LOT more. Believe me, this will be one of the highlights of your trip. Whatever you do, you’ll want to take plenty of their homemade fudge home with you. Heck you may even want to bring an extra suitcase to pack it in.